DALLAS, TX – The Naked Girls of Dallas, Texas have been leading the charge in our Revolution for F-READ-OM, and not just with their fine figures! This ship of curvaceous and clever cadets – captained by local celebrity Black Mariah – are tirelessly pushing forward on the front lines of fiction, fantasy, farce and folklore in the most naked way they know how. Read the most recent glowing account of their endeavors HERE. 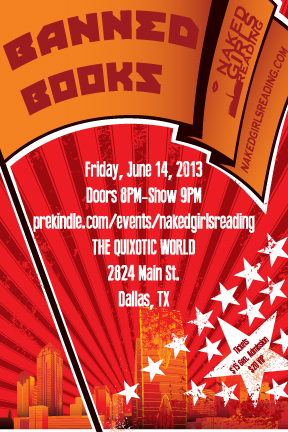 This Friday, June 14th, the Dallas Naked Girls take to the stage again, and this time, they are bringing you the books you were never supposed to read. Naked Girls Reading Presents: BANNED BOOKS! promises to challenge and scandalize your aural sensitivities, and whether you’re a Naked Girls Reading die-hard or a nervous newcomer, this is a salon you don’t want to miss. Grab your tickets before they sell out, and join the Girls at “Dallas’s sexiest literary event” this Friday! !